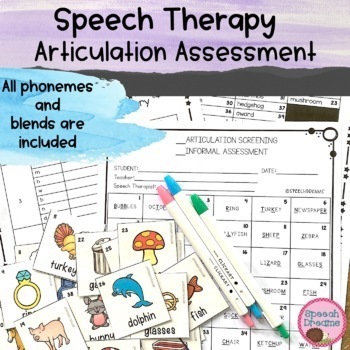 Use this helpful articulation assessment or speech screening instrument for all phonemes, including blend sounds to help you determine if a child needs further speech assessment. This assessment only takes a few minutes to administer! I needed a quick and easy way to thoroughly screen during the school year. 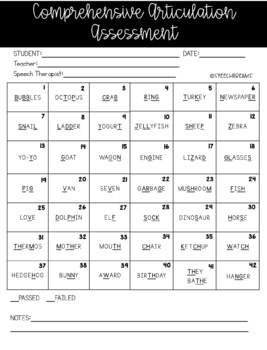 I also wanted a way to quickly assess my current students at the end of the year to make sure that I hadn't overlooked any sounds that they needed to work on, or to see if they were ready for dismissal. I have included a form that will allow you to keep up with the students that you need to screen and a speech error sound inventory. The speech inventory list will allow you to take a look at the errors made in which position and you can use the rubric to help you decide if the error sounds are age appropriate or not. The student visuals are in black and white or color. I have laminated the color visual form that I use, so that they will last a long time. You could also hand out the black and white form and have the student stamp or color each picture as they say it. 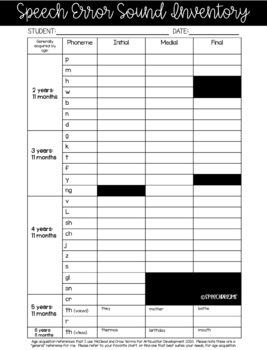 The target phonemes are in italics and underlined on the therapist form. 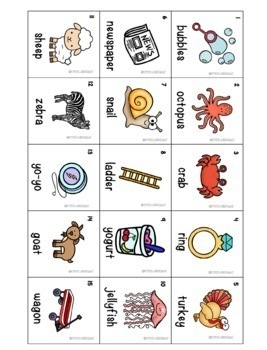 All phonemes and one of each of the following blends are included: gl/sn/cr. Speech Language and Articulation Screening Forms.